TJC Engineering, Inc removed and replaced corroded and clogged Hydraulic piping in the bottom of the Green River Lock. To replace the pipe, the lock workers drained and cleared the chamber down to the plates that covered the pipes. With the bulkhead in place, ground crews managed diesel pumps 24 hours a day to keep the leaking water out of the work area. 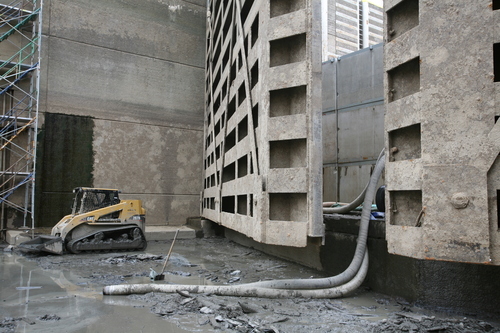 TJC utilized the gravity dams from a previous task order to block water in the lower end of the lock. The labor team operated diesel pumps in the lower end to keep water out of the work area. Workers demolished the existing concrete casing and poured new curbing around the new hydraulic pipe.